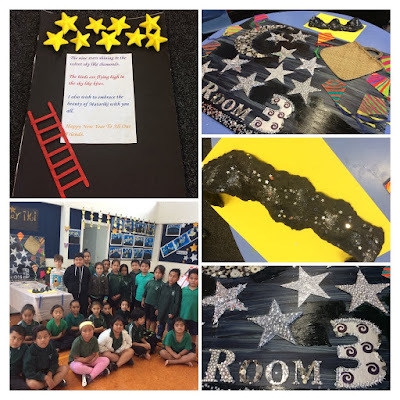 We are a Year 3 and Year 4 class in Glen Innes, Auckland, New Zealand. Our teacher is Mrs Sandhya Goundar. We have made a good progress for our upcoming whakapapa family tree. There are more photos now and we have put some leaves as well. Room 9's have drew their family pictures on the leaves. Just to add more detail we have painted some red cherries and flowers amongst the green grass. Our next step is to put up a Title for our family tree. Any ideas are most welcome!! Room 9's are working on a culture display this week and we made a tree with branches. Then we used brown paint for the stem and branches. Later on we used green paint to draw the grass. The final step is to put our family photos. The purpose of our whakapapa is to strengthen our family root and know more about our family ties. We were thrilled to receive our chromebooks. Talofa lava, Bula Vinaka, Kio ora, Malo e leiei! We enjoy learning at Glen Innes School. It makes us happy and smart. We look forward to sharing lots of learning on our blog this year. Room 3 News Channel - A Manaiakalani Film Festival entry. Get ready for Room 3's News Channel - bringing you news and views from all over Glen Innes School. Happy Matariki,,, The nine stars shining in the velvet sky like diamonds.